The NHL Entry Draft used to be pretty straight forward: find the best player available, draft him, and pound him into shape until he either makes or breaks your hockey team. Well, times have changed. Recruiting hockey players involves a lot more than watching games everywhere from The Soo to Finland to Arizona. While the verbal surrounding the draft still focuses on finding the best player available, from team to team, best player available has different definitions. 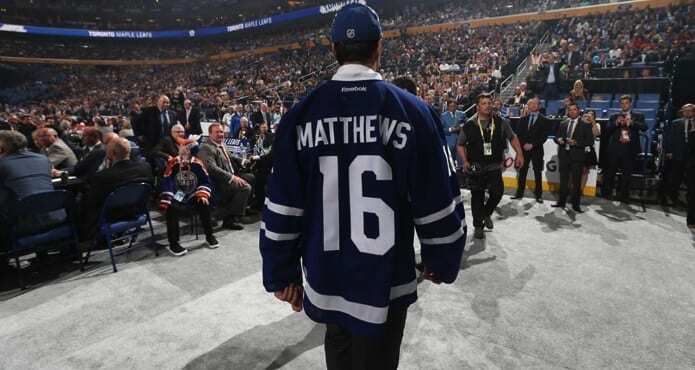 When you watch young athletes walk the stage at the NHL draft, pull on the sweater of the team that now holds his rights, that’s just the tip of the iceberg. The amount of hours spent on this individual by scouts, player personnel types, and general managers is astronomical. And that’s just one player! For the Buffalo Sabres its a little easier. Is Rasmus Dahlin a good person? Yes? Ok good. Is he a cancer in the dressing room? Ok, not as good. They’re still taking him, though. For everybody else, it’s crucial to paint a picture of the impact new players will have on the culture of a hockey team in games and practices. Yes, skill on the ice matters. However, if character, practice habits, or expectations prevent that skill from being utilized? That’s a problem. It’s a common misconception that every player who earns the right to be drafted into the National Hockey League has impeccable habits on and off the ice. It’s not true. Some players have solid habits, some need to work on their preparation, and some players, the most frustrating of the bunch, have enough natural talent that it’s brought them this far without the benefit of all the other stuff. And that’s just professional hockey. Recruiting hockey players at the college level is its own animal. The point about the habits still stands, but you van’t make trades in college hockey (easily). It’s vital to a university hockey program’s longterm health to find people whose values align with those of the team. You’re bringing in people who will have an impact on your group every day for up to five years. No one likes to admit halfway through they made a mistake. It’s stressful, but it’s one of the most exciting times of the year. Flying a prospect into town to see your school, your facilities, his potential future teammates and coaches – it’s a breath of fresh air to finally put a face to the stats. And what if that visit doesn’t go well? Every coach values different things when it comes to meeting recruits. Were they well-spoken? Polite? Did they get along with veterans? Were they genuinely interested in the specific amenities of your program? Have they done their homework on you? As we know, there’s no replacement for communication. Which opinions do you value when it comes to intel on recruits? Former coaches? Former teammates? Their parents? Speaking of their parents, what are they like? Were they lighting fires in the crowd during the minor hockey days to make sure it was known they weren’t happy about ice time? Maybe they carried around a stop watch. It comes down to your core values. These days players are more prepared than ever for the draft and recruiting trips. They’re taught how to talk about themselves. However, that can be a problem as well – if you can get past the stock hockey player answers and learn something, truly gain insight into what makes the person, not the player, tick, then you’re much more likely to feel confident you’ve got a culture match on your hands.